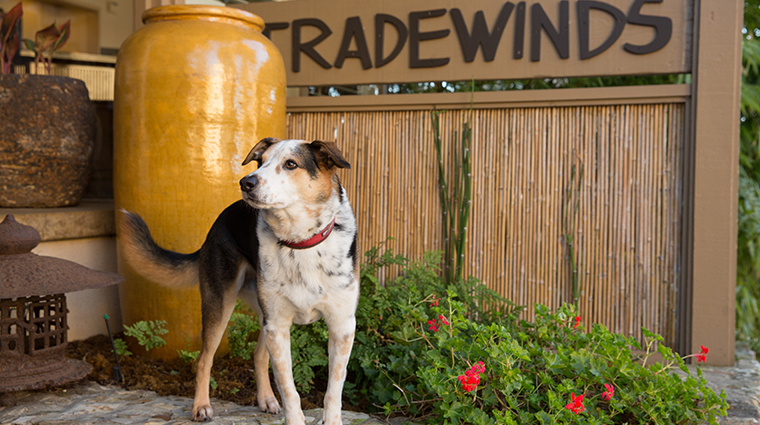 Tradewinds Carmel has been owned and operated by the Catlin family since it was built in 1959. In the late '90s, current proprietor Susan Stilwell, daughter of founders Richard and Patricia Catlin, hired designer Charles Gruwell for a major renovation of the Asian-style property; the changes even resulted in an Architectural Digest feature. Bathrooms were gutted, new carpets and furniture were brought in and the swimming pool was taken out. In its place came a Meditation Garden with a large Temple Bamboo, stone fire pit and a recessed alcove Buddha fountain. Foo dogs stand ceremoniously by the lobby door but it’s still a family affair with Sweetie, the house feline adopted from the humane society, greeting guests at the registration desk. 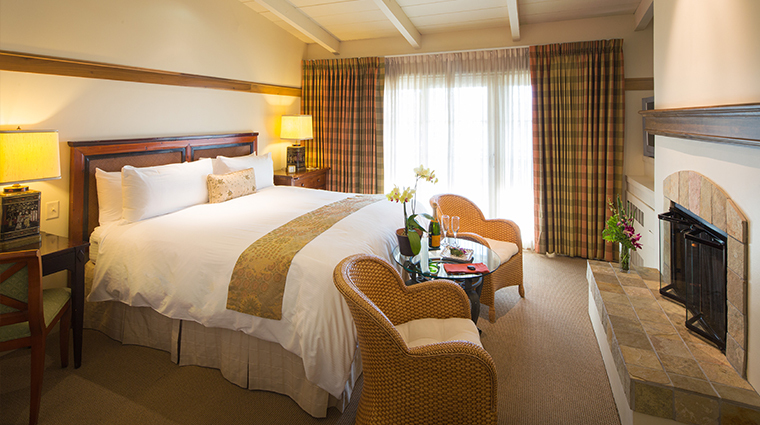 Tradewinds is ideally located in the village of Carmel. It’s just outside the busy part of downtown, so it’s quiet. But you’re just a few blocks’ walk to many restaurants and art galleries that Carmel is known for. 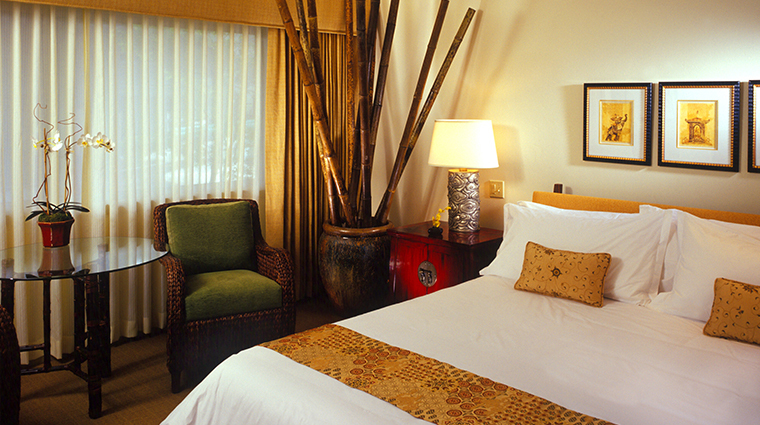 The guest rooms at the NoCal hotel have a refined Asian aesthetic that is carried through in all the details. A trickling bamboo fountain greets you as you step inside and furnishings all are Japanese in style, with grooved cabinets, a vanity-style sink and woven armchairs. You’ll find a personal welcome note and a pair of chocolate-dipped strawberries on the café table when you arrive in your room. And if you are still hungry, just open up one of the bags of complimentary nuts, pretzels or gummy candies. A breakfast room near the reception area offers a complimentary and generous continental breakfast that includes a wide variety of fresh fruit, bagels, pastries, yogurt, dried cereal selections, tea and coffee. The terraced courtyard in the center of the Carmel restaurant is a tropical paradise filled with sago palms, elephant ears, flowering ginger and ferns amid fountains, Buddhas in various guises and a fire pit. Carmel-by-the-Sea has a variety of small restaurants and pubs, but it’s not a place known for its nightlife. For that, you may have to drive into Monterey. The luxury hotel is more of a relaxation spot. 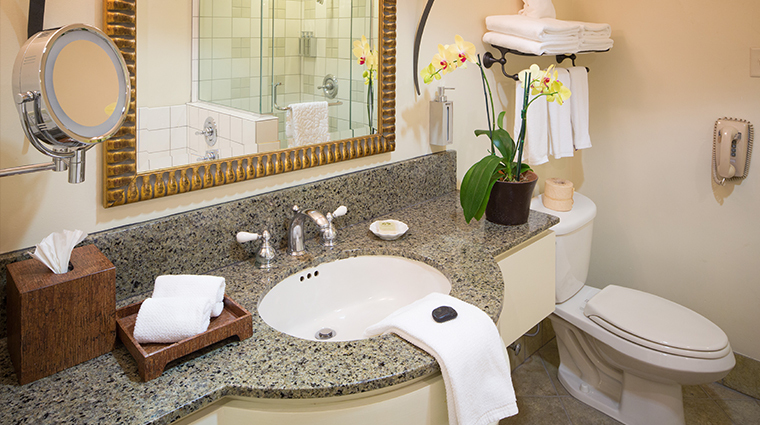 This Forbes Travel Guide Recommended hotel’s king rooms come equipped with better amenities, like jetted bathtubs and gas fireplaces, that are absent in rooms with two queen beds. Be sure to bring a warm casual coat, scarf and hat, especially in the wintertime. The sun shines, but it’s often around 52 degrees F during the day. 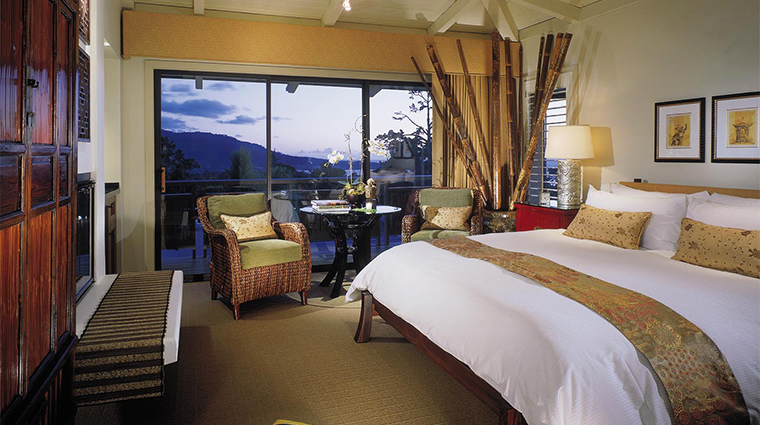 Tradewinds Carmel has 28 bright and airy Asian-inspired rooms. 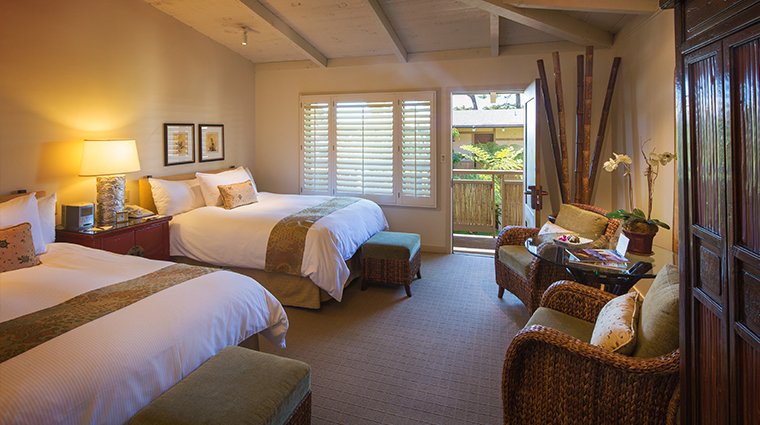 Top floor accommodations boast open beam ceilings and many rooms have coastal views. If the tabletop bamboo water feature doesn’t put you to sleep, the goose down feather beds, Thai silk pillowcases and Frette linens will. 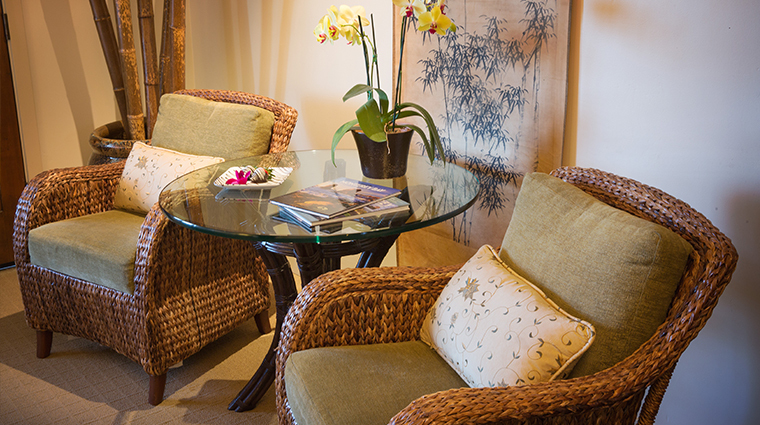 The spaces are decorated with art, custom furnishings and silk accents from Bali, China and other parts of Asia. Kimono robes and complimentary snacks are nice touches. 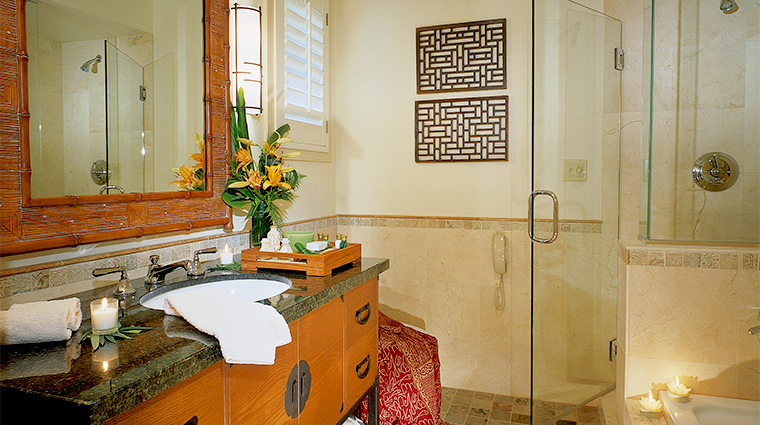 Bathrooms are spacious and boast organic bath amenities; book a king room for a separate tub and glass-walled shower. The Forbes Travel Guide Recommended hotel evokes a Polynesian escape, with its bamboo detailing, palms and rustic stone exterior. Once inside the courtyard, which has a stream, expect the tranquil retreat to begin its subtle transport. The giant ferns, tumbling waters, bamboo, arbors and antique lanterns feel more like Bali than California. Rooms have warm, chic hues — cream, tan and brown, with subtle accents in other shades. 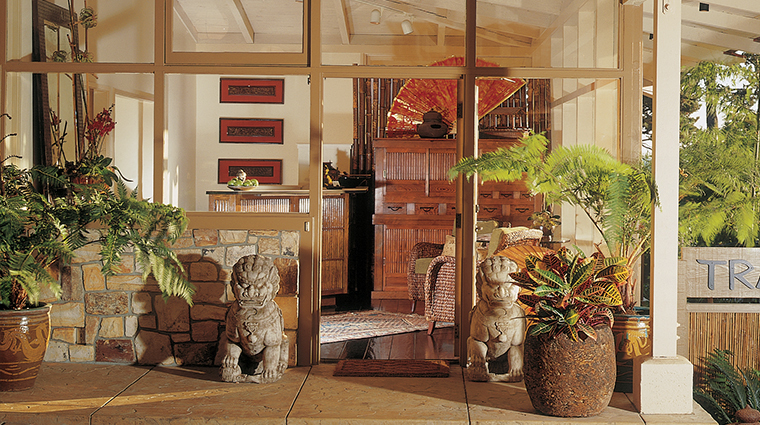 A trickling fountain filled with river stones and a bamboo holder with a fresh orchid adorn the foyer. 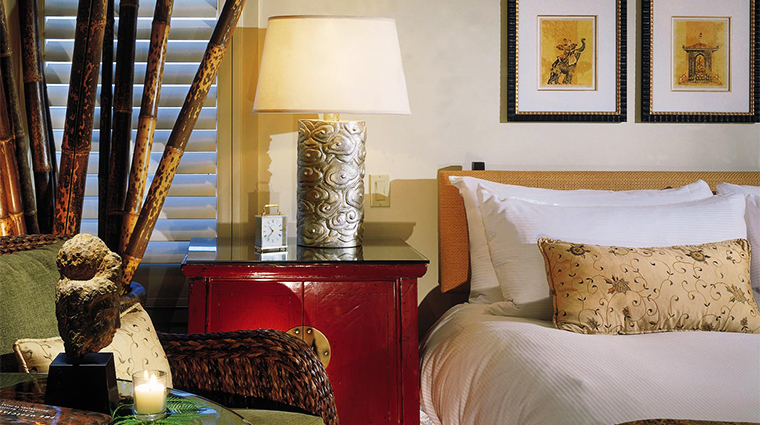 Furnishings like an armoire reminiscent of bamboo, silver-cloud-patterned lamps atop deep-red Chinese bedside chests and a pair of woven armchairs flanking a glass café table with a base of bamboo bands create an upscale Asian atmosphere.